César Chávez is one of the greatest labor leaders and human rights activists in the United States history and the world. He fought for a better life for migrant farm workers, and founded the first successful farm workers’ union. César was the president of the United Farm Workers, AFL-CIO. César Estrada Chávez was able to accomplish his goals through the philosophy of non-violence that he inherited and followed from leaders like Mahatma Gandhi and Dr. Martin Luther King. César read about St. Francis of Assisi, Mohandas K. Gandhi and Dr. King. St. Francis was an Italian monk who lived from 1182 to 1226. He devoted his life to helping the poor. Gandhi was spiritual leader and a non-violence revolutionary who lived in India from 1869 to 1948. He practiced the philosophy of non-violence. Martin Luther King, Jr. was a Civil Rights Leader in the United States. These men profoundly influenced César Chávez, and he realized that great leaders are those who set good examples. César Chávez adopted and practiced the philosophy of non-violence. On March 31, 1927, Cesar Estrada Chavez was born. His parents, Librado and Juana Estrada Chavez, lived on a small farm near Yuma, Arizona, that his grandfather homesteaded during the 1880’s. 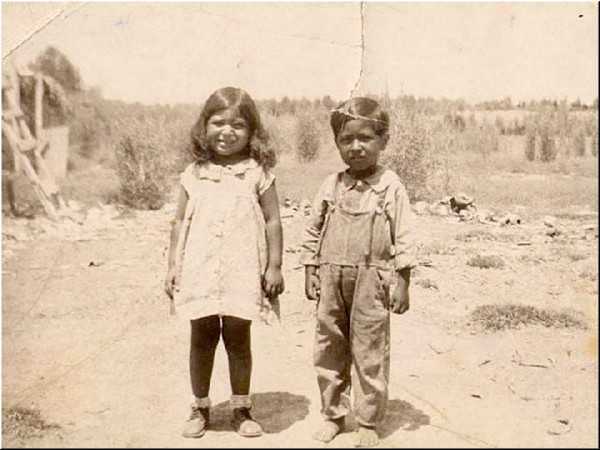 The Chavez family lost the farm during the Great Depression and began travelling between Arizona and California as migrant farmworkers. Chavez’s father was injured in a car accident. Cesar quit school to take his father’s place in the fields. Along with his brother and sister, he thinned lettuce and beets with a short-handled hoe; a practice he later helped to outlaw. In Delano, California, Cesar Chavez challenged the segregation policy in theaters by refusing to sit in the “Mexicans” section; he was detained by the police for one hour. 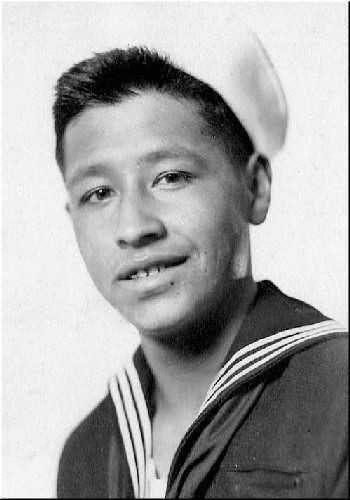 Chavez enlisted in the U.S. Navy. While serving in the Pacific during World War II, he witnessed discrimination against Americans of other nationalities. Chavez was discharged from the Navy and returned to his family in Delano, where he resumed work in the fields. At this time, Chavez joined his first union, the National Agricultural Workers Union. The Chavez family joined the National Farm Labor Union (NFLU) and participated in a cotton strike. The Chavez family moved to San Jose, California, where Cesar worked in a lumber mill. Chavez met Father Donald McDonnell, a Catholic priest from San Francisco who was sent to work with the farm laborers and braceros. Fr. McDonnell educated the workers on labor organizing and social justice. Chavez read the papal encyclicals on labor, books on labor history, the teachings of St. Francis of Assisi, and Louis Fisher’s The Life of Gandhi . These works heavily influenced his philosophical approach to the farm workers movement. Chavez is recruited into Saul Alinsky’s Community Service Organization (CSO), a barrio-based activist group that fought against racial and economic discrimination against Chicano residents. Chavez was sent to Oxnard, California, by the CSO. Chavez documented abuses by the Farm Placement Service, organized a boycott of local merchants, and organized sit-ins and marches to protest the lack of jobs for local residents. These tactics become standard techniques used by the United Farm Workers Union. The Agricultural Workers Organizing Committee (AWOC) was founded in Stockton, California, by Fr. Donald McDonnell, Fr. Thomas McCullough and Dolores Huerta. Cesar Chavez resigned from the CSO and moved his family to Delano, where he founded the Farm Workers Association (FWA). He began recruiting workers and opened a credit union to provide for members with financial emergencies. Chavez persuaded his cousin, Manuel Chavez, to help with the organization, and convinced Dolores Huerta to quit the CSO and join the FWA. The National Farm Workers Association (NFWA), a forerunner of the UFW, was formally established at an organizing convention. Chavez was elected president and executive officer, Dolores Huerta and Gilbert Padilla were elected vice-presidents, and Antonio Orendain was elected secretary-treasurer. The Union flag of the black eagle on a red background was accepted as the official emblem, and “Viva la Causa” was accepted as the official motto. The NFWA had 1,000 dues paying members and 50 locals. The union headquarters opened in Delano. “El Malcriado: The Voice of the Farm Worker” becomes the official newspaper of the NFWA. The Civil Rights Bill is passed, banning discrimination in voting, employment, and public accommodations. The Agricultural Workers Organizing Committee (AWOC), with support from the NFWA, led Filipino workers in a strike against grape growers in Delano. They received further support from the Student Nonviolent Coordinating Committee (SNCC) and the Congress of Racial Equality. After a ten-day strike, the Filipino workers won a raise for themselves and Mexican-American workers. NBC airs “A Harvest of Shame,” a television special which depicted the tragic conditions of migrant laborers in the United States. The NFWA and the AWOC launched a campaign to boycott grapes. Walter P. Reuther, head of the United Auto Workers, met with Chavez in Delano, which brought national attention to their cause. Chavez led a flower workers strike in McFarland, California, that brought about wage increases. Migrant workers in Porterville, California, went on strike to protest rent increases in migrant farm worker camps. Senator Robert Kennedy openly expressed his support for the NFWA grape boycott and strike during the Senate subcommittee hearings on agricultural labor in Delano. On March 16th, Cesar Chavez led 75 people in a march from Delano to the steps of the state Capitol in Sacramento, California, to call attention to the plight of farm workers. They receive the endorsement of the AFL-CIO. On April 14th, the marchers arrived 250 miles later in Sacramento, California. Ten thousand people attended the rally. The National Farm Workers Association (NFWA) and the Filipino American Agricultural Workers Organizing Committee (AWOC) merge to form the United Farm Workers (UFW), affiliating with the AFL-CIO, the national labor federation. On February 14th, Cesar Chavez began a 25-day fast as a rededication to his call for a non-violent movement. 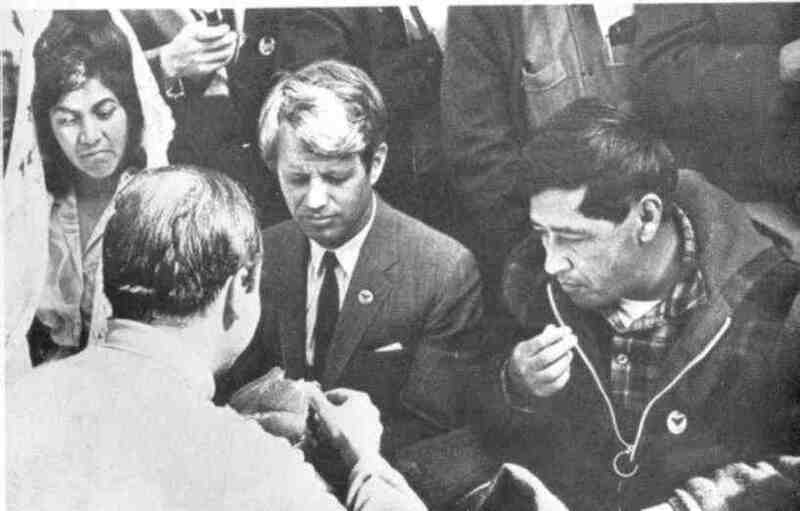 On March 10th, Cesar Chavez breaks his fast with his wife, Helen, and Senator Robert F. Kennedy by his side. Farm workers developed symptoms of pesticide poisoning. The union began researching the dangers of pesticides to the workers and consumers. A nationwide boycott of all California grapes is called. The UFW declared May 10th International Grape Boycott Day. Throughout the year, shipments of California table grapes were stopped in Boston, New York, Philadelphia, Chicago, Detroit, Montreal and Toronto. In England, British dockworkers refused to unload California grapes. Chavez organized a march from the Coachella and Imperial Valleys to the United States-Mexico border to protest the use of undocumented immigrants from Mexico as strike breakers. He is joined along the way by the Rev. Ralph Abernathy and Senator Walter Mondale. During contract renegotiations, the farm workers union added clauses which called for the regulation of pesticide use and its exposure to the workers. Chavez and union leaders picketed the U.S. Food and Drug Administration to protest pesticide hazards. On December 14th, Cesar Chavez was jailed for defying a court injunction against boycotting. He was visited in jail by Coretta Scott King and Ethel Kennedy. On Christmas Eve the California State Supreme Court ordered Chavez released, pending appeal. On January 25th, outside the Talisman Sugar Plant near Belle Glade, Florida, Nan Freeman was killed in the second week of a UFW picket. Despite repeated complaints to local police of harassment from truck drivers, Ms. Freeman, an 18-year-old college student, was knocked unconscious when a trailer load of cans knocked her against a guard railing. On May 12th, Cesar Chavez began another fast to promote a recall campaign against Arizona Governor Jack Williams. Medical problems forced him to end the fast on June 4th. During the campaign, UFW members registered many new voters, which led to the election of the first Mexican American governor in Arizona’s history, Raul Castro. In California, Proposition 22, an initiative to outlaw boycotting and limit secret ballot elections to full-time non-seasonal farm workers, is defeated. UFW Union member Negri Daifulla, an immigrant from Yemen, was killed on the picket line. UFW Union member Juan de la Cruz was killed on the picket line. 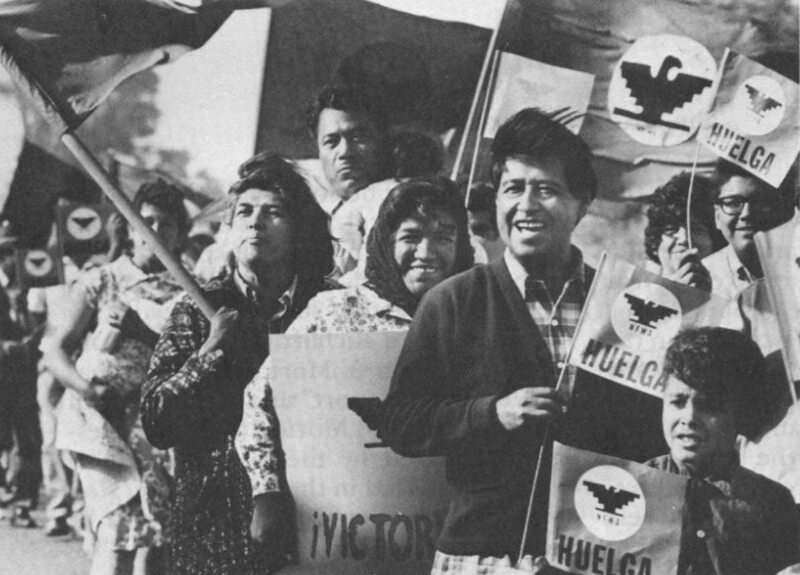 The United Farm Workers of America, AFL-CIO, held their First Constitutional Convention in Fresno, California. Senator Edward Kennedy and Leonard Woodcock, UAW president, gave speeches of support. A 111-page constitution is adopted. The California Labor Relations Act was enacted, becoming the first law governing the organization of farm labor in the continental U.S. It provided for secret ballot elections, the right to boycott, voting rights for migrant seasonal workers and control over the timing of elections. The Agricultural Labor Relations Board (ALRB) is established to administer the elections. California Governor Jerry Brown appointed LeRoy Chatfield, a former union organizer, and Bishop Roger Mahoney, who had earlier mediated between the union and the Teamsters, to the five member board. Chavez led a 1,000 mile march through the Imperial and San Joaquin Valleys to promote upcoming union elections. The use of a short-handled hoe, “el cortito,” was effectively outlawed by a U.S. Supreme Court ruling, Sebastian Carmona et al vs. Division of Industrial Safety , and a California administrative ruling. Cesar Chavez announced that grape and lettuce boycotts are over, and that boycotts will now target specific labels. Chavez began an internal reorganization of the UFW. Many longtime staff members left. On February 10th, UFW member Rufino Contreras is shot and killed by armed company foremen on an Imperial Valley lettuce field during a workers’ strike. Chavez announced a new grape boycott, emphasizing the issue of pesticide residue on fruit. The U.S. suffered the worst drought in more than 50 years; half the nation’s agricultural counties were designated disaster areas. On August 16th, Cesar Chavez fasted to protest pesticide usage. Thirty-six days later, Chavez broke his fast with Jesse Jackson and the Robert Kennedy family at his side. The UFW helped organize large-scale walkouts in the Coachella Valley to protest the lack of drinking water and sanitary facilities for farm workers. In the Salinas Valley, Chavez led more than 10,000 workers in a protest march for better conditions in the field. On April 23rd, after fasting for a few days to gain moral strength, Cesar Chavez died in his sleep. More than 35,000 people attended the funeral, following his casket for three miles, from Delano to Forty Acres. Cardinal Roger Mahoney led the funeral mass, offering a personal condolence from the Pope. Cesar E. Chavez is laid to rest in Keene, California. Cesar E. Chavez was posthumously awarded the Presidential Medal of Freedom, the United States’ highest civilian honor, by President William Jefferson Clinton. 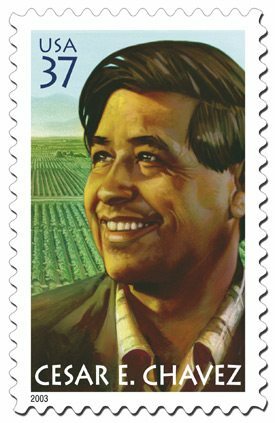 In April, the United States Postal Service will issue a Cesar E. Chavez commemorative stamp. The stamp image was painted by Roberto Rodriguez based on a photograph taken by Bob Fitch in 1976. What an amazing life. And what stands out the most to me is how he accomplished so much through non-violent means. It’s no coincedence that the most revered protesters and civil rights leaders in history are those who did not resort to violence. Agreed. Non-violence is kind of dangerous because it makes people listen! Never been one for idolatry, but this man is one of two true heros to me. Cesar, and Dr. King, IMO America has produced no greater. Late 60’s and early 70’s I was living in Pittsburgh PA, far from the place I would ultimately call home. You know what? We boycotted grapes. In Pittsburgh. Forty some years later I still feel good about it, that I was connected to a verdadero hero whom I would have cause to learn so much more about. Viva! A great union leader ; a great human being; proud to have met him San Antonio , Tx. HELLO. I am writing to tell u that Cesar Chavez has been a very good leader to defend their people. Wonderful article about this wonderful man to do what he did w/o giving up his long struggle to help farmworkers. Thanks so much for the full bio of what he did. I came to CA in ’71 and first heard about what he was doing, and backed him all the way. I grew up on a dairy farm in Wis. and didn’t have to milk cows but did help in the barn to feed the cows and that meant every summer picking up stones before the fields got planted and then helped pick raspberries to be sold. No swimming pools for us but a pond across the street dug by that farmer for his cows, but luckily they didn’t use it, so we did to cool off when the work was done. It was an eye-opener to hear about the bad conditions the farmworkers in CA put up with, and so glad this wonderful man and others did something about it. They are heroes for sure. I met him in Tolleson, Arizona . Hello, I am currently working on an AP United States History project in which I must find a quality photograph of someone with historical significance. I am interested in placing the photo labeled “Cesar Chavez and the UFW -1965” on my project but need the name of the photographer. If anyone has any idea as to who the photographer is, please reply. Thank You for your help. Who is Cesar Chavez ? Maybe try reading the article. Newer Article: A Hard Rain’s Gonna Fall on California: GOP Quashing Brown’s Special Election?